"One of the great books of our time." "One of the outstanding contributions to psychological thought in the last fifty years." 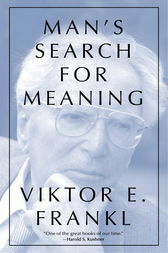 Viktor E. Frankl was professor of neurology and psychiatry at the University of Vienna Medical School until his death in 1997. His twenty-nine books have been translated into twenty-one languages. During World War II, he spent three years in Auschwitz, Dachau, and other concentration camps. Harold S. Kushner is rabbi emeritus at Temple Israel in Natick, Massachusetts, and the author of bestselling books including When Bad Things Happen to Good People, Living a Life That Matters, and When All You’ve Ever Wanted Isn’t Enough. William J. Winslade is a philosopher, lawyer, and psychoanalyst who teaches psychiatry, medical ethics, and medical jurisprudence at the University of Texas Medical School in Galveston.